Who are the rich in this country? What do they do? How did they get rich? Can I become one of them? The Millionaire Next Door provides some very interesting and, perhaps, surprising answers to these questions. The authors, Dr. Stanley and Dr. Danko, are two academics who have dedicated much of their time to study millionaires, and the research behind this book is very comprehensive. “Twenty years ago we began studying how people became wealthy. Initially, we did it just as you might imagine, by surveying people in so-called upscale neighborhoods across the country. In time, we discovered something odd. Many people who live in expensive homes and drive luxury cars do not actually have much wealth. Then we discovered something even odder: Many people who have a great deal of wealth do not even live in upscale neighborhoods. That small insight changed our lives“. 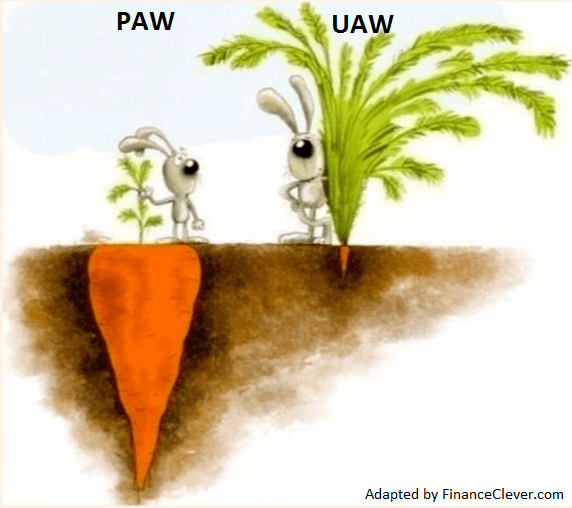 Another way the authors describe the typical UAW is as someone with a “big hat, but no cattle“. You get the idea. PAWs live well below their means, which allows them to accumulate wealth and achieve financial independence. On the other hand, UAWs tend to consume most of their income and find themselves living paycheck to paycheck. UAWs have a long list of fears, worries, and concerns while PAWs tend to have far fewer worries and lower stress levels. PAWs often purchase used cars and their vehicles represent less than 2% of their net worth. Meanwhile, UAWs tend to buy newer, more expensive vehicles, which represent a high share of their net worth. The adult children of PAWs are often economically self-sufficient, while the adult children of UAWs tend to rely more on parents and/or debt to make ends meet. This is by no means a comprehensive list. I recommend reading the entire book to get all of the insights. The real life examples are also very enlightening and entertaining. Economic outpatient care (EOC) refers to the substantial economic gifts and “acts of kindness” some parents give their adult children and grandchildren. The studies show that “In general, the more dollars adult children receive, the fewer they accumulate, while those who are given fewer dollars accumulate more“. At first, this may seem counter intuitive but it makes perfect sense if you think about it. Imagine two bear cubs. Cub B is always provided with food courtesy of mama bear. This causes Cub B to become dependent on his mother, so he never learns to hunt and find food for himself. Cub A meanwhile, is only given food for a short time; so, out of necessity, he learns to hunt and find food for himself. When mama bear is no longer around, Cub B will probably starve while Cub A will thrive, even though Cub B was the one that always got the easy food. Does that mean you should not give anything at all to your adult children? Not necessarily, the data shows that paying for an adult children’s college education is much better than giving them cash. The EOC section of the book has other useful advice as to how and when one should distribute wealth to adult children in order to increase their chances of being productive and becoming financially independent. Overall, The Millionaire Next Door is a really interesting book. I recommend it to anyone interested in financial independence. You can buy this book online or try finding and reading it for free at your local public library ???? a well-established website like yours require a massive amount work? From what I understand, creating an actually well-established website can indeed take a lot of work. Things like publishing often and in a regular schedule are said to be helpful, and it can take a lot of time before you start to see any results. So, you should probably have a strong reason for writing beyond just having a big audience for its own sake. Like passion for the subject matter you are writing about, or for the process of writing itself. I’m no expert by any means but those would be some of my tips for what is worth.